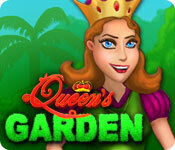 Queen's Garden is rated 3.7 out of 5 by 26. Rated 5 out of 5 by MsReddFox from I Love This Match-3 Game! I bought this game right after playing the demo and I've already played it three times. It's so cute! I love the little "OH" sound that the queen makes as she walks through the garden, and I especially really like the game sounds. I love the tinkle of the ice breaking, and all the other weird sounds. The playing field is nice and large with different objects that are colorful, and you can play timed, untimed, and/or restricted # of moves. I play untimed with no restrictions. You build the queen's garden as you collect money and you can choose between three different bushes, pots, etc for the one you want. I do wish the game was longer, and I have to say that the queen looks more like the king's daughter than his wife. lol In any case, I really enjoy playing this game and I think you will, too. I know the king and queen are cartoon looking, but that just adds to the fun. 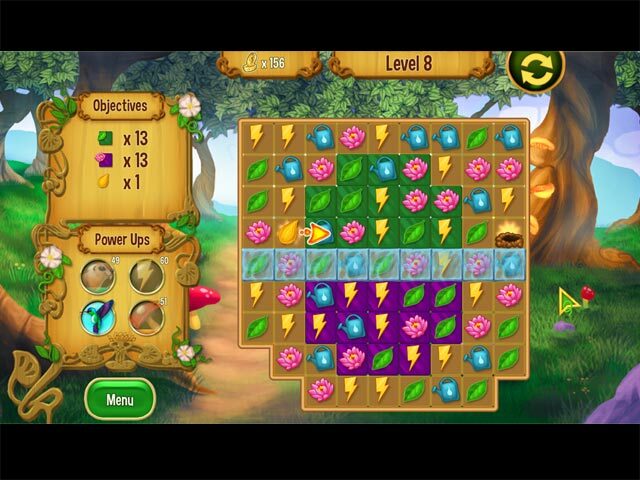 I play hidden objects games as well, but I wish they'd give us more match-3 games...especially like this one! Rated 5 out of 5 by rubyretro from Always sunny in THIS garden I play Match 3 to escape, wow was I surprised when I had to engage & concentrate to win on timed mode. The farther in you play the more FUN! I was surprised to find myself ' timed out " on more than one level, Well this " self proclaimed " expert had a blast. Don't let the flowers or " CARTOON" look stop you l I'm glad I took some good advice & tried this game. I was so sad when I finished then I realized I can BUY it! So I did! lol great time til the end then I played it again. THANKS BIG FISH!!!! Rated 5 out of 5 by Bilyeu5 from Fun; Not Frustrating I'm enjoying that there is variety in the game play as you earn money to restore the Queen's garden. Also like the fact that there are 3 different options for each decorative item. Just the kind of game I like: low stress factor without being too repetitive. Rated 5 out of 5 by arneybaby from Great match 3 I have been waiting a long time for a new game. This one is fun. You can play with time or without and I like that. Rated 5 out of 5 by TurkeyFur from Reminiscent of Gardenscapes... Great little fun game, suited to kids and adults alike. No stress here, just a good old fashioned M3 game, play to earn points with which to buy upgrades Played the demo and will be a definite buy for me. Although I love a hidden object game with a great story line, it is nice to sit back and relax with a game like this. Very "Gardenscapes" in it's presentation, graphics are awesome! Recommend this as a great family game! Rated 5 out of 5 by DrDavid from Quite an unusual M3 This is a M3 with colored tiles which are removed by a match above them, but in this game only one particular match of 3 items will remove the tiles. Other matches do nothing to them. After that, vine covered tiles and frozen tiles are like other games. Another quirk is the almost total lack of instructions. Good luck. Figure it out yourselves. Fortunately, that isn’t too hard. However, on one board there is an arrow pointing left to right and constantly in the way. It seems to be pointing to a bird’s nest which also is in the way. After some time you may notice that the arrow has a clove of garlic behind it. The object is to move the garlic into the bird’s nest. Then a sprout will grow and you will figure out that the garlic was a seed and the nest a pot or something. There are also butterflies in bubbles to release in some boards. After several boards I found that they can be removed with the obvious explosion or by dropping them off the bottom. No instructions! 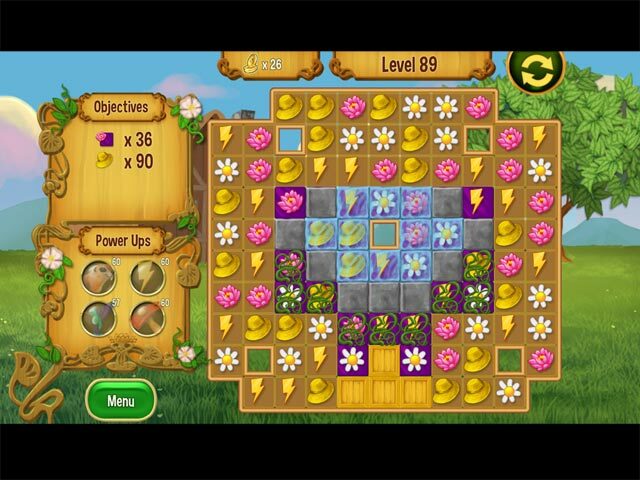 In a way, this game is similar to Gardenscapes but rather than earn coin by finding and selling hidden objects, one earns coin by clearing M3 boards. All in all, I have completed 45 boards and I am pleased with the game. Rated 4 out of 5 by Sibboersteres from I like it :-) This is a very funny game. No ghosts, witches or other unfriendly people. I'm a fan of hidden object games, but I'm bored with the stories with ghosts, bad people and witches. This is the reason for my change to match 3 with funny and friendly graphics. Rated 4 out of 5 by denniann2 from a good match 3 game it got kind of repetitive after a while but it is a straight match 3 with a few, very few, hidden object scenes. they are fairly simple. good game for the kids or adults. kids may get tired of it after a while. they could come back to it. the attention span of the child would be the factor. no power ups or anything.